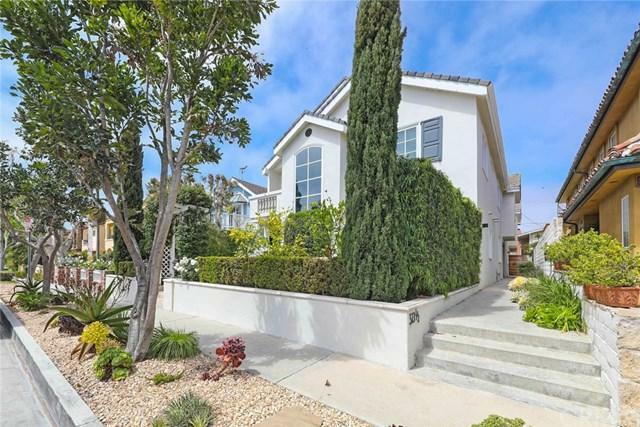 Amazing opportunity on the ocean side of Pacific Coast Highway, on the prettiest street in Corona Del Mar. Very rare back unit on a 45' wide lot.This unit is 3 bedrooms and 3 bathrooms with a desirable downstairs bedroom and full bathroom. Remodeled gourmet kitchen comes complete with light modern Caesar-stone counter-tops, stainless steel appliances, glass back splash, breakfast bar and plenty of storage and counter space. Open floor plan with kitchen open to dining and family room, which includes a glass tile fireplace surround and a wet bar. The bright master suite features a fireplace, large closet and an en-suite bathroom. Master bathroom has been completely remodeled with Caesar-stone counter tops with dual vanities and full walk-in glass shower with bench. The finish work is exquisite with a Cape Cod motif. There are 2 other second story decks for outdoor enjoyment one on the second level and 1 on the roof. Retire to the rooftop deck for evening cocktails while watching the sunset over the ocean. Take advantage of this opportunity while you still can. Great neighborhood! The home is walking distance to beaches, shopping, fine dining. Close to the world-famous golf at the Resort at Pelican Hill, shopping at South Coast Plaza and the OC Airport. The home+GGs interior has just been painted.